1702년(숙종 28) 탁휘(卓輝)·법해(法海)·설잠(雪岑)·성징(性澄) 등이 제작된 괘불탱이다. 화면 중앙에 크게 묘사된 석가여래를 중심으로 좌우에 문수보살과 보현보살이 서있고, 화면의 상단에는 아난과 가섭, 2명의 제자가 합장한 모습으로 상반신만 표현되었다. 좌우협시는 본존불보다 한 발짝 앞서 겹쳐 표현하여 공간감과 입체감을 드러내고 있다. 본존 석가여래의 수인은 통상의 항마촉지인이나 설법인이 아닌 오른손을 어깨로 들어 연꽃가지를 들고 있다. 그림의 화기(畵記)에 “영산회도일부봉안(靈山會圖一部奉安)”이라고 분명하게 기록하고 있기 때문에, 이 도상은 선종의 염화시중과 조선시대에 성행한 선교합일(禪敎合一)을 상징적으로 표현한 것으로 이해된다. 특히 이 작품은 현재까지 알려진 불화 중에서 염화시중(拈華示衆)의 내용을 표현한 불화 중에서 가장 이른 시기의 작품이다. 선석사 영산회괘불탱은 제작시기가 비교적 빠르고 연꽃을 든 석가여래 도상의 선구적 위치에 있다는 점, 이 그림을 모본으로 하여 예천 용문사 영산회괘불탱(1709년, 보물1445호)가 현존 한다는 점 등에서 불화도상의 계승을 살펴 볼 수 있는 매우 중요한 의미를 지닌다. 또한 색채감각이나 필선이 매우 세련되고 뛰어나 18세기 전반기를 대표하는 괘불화이다. This Buddhist painting was painted in 1702 (the 28th year of King Sukjong’s reign) by four monk painters, including Takhwi, Beophae, Seoljam and Seongjing. Sakyamuni Buddha in the center, portrayed larger than the rest of figures, is escorted by two attendant Bodhisattvas, Manjusri and Samantabhadra Bodhisattva, standing to his left and right. In the top tier of the Buddhist painting, Ananda and Mahakasyapa, along with two other disciples of Buddha, are portrayed down to the waist, with their hands gathered in a gesture of reverence. The left and right attendant Bodhisattvas are portrayed in a slightly more forward position than Sakyamuni, so that their bodies are overlapped, in a manner to emphasize the spatial depth. Sakyamuni Buddha’s hands, meanwhile, are not in the usual position of bhumisparsa or vitarka mudra. Instead, his left hand is lifted to the shoulder level, holding a lotus stem. The note on the back of the Buddhist painting means “one copy of the Vulture Peak Assembly scene enshrined,” suggesting that this painting symbolically expresses the Zen Buddhist idea of the truth that is beyond verbal explanation and the unity of Zen and non-Zen Buddhism, popular during the Joseon Dynasty. Notably, this Buddhist painting is the oldest surviving Buddhist painting hinting at the idea of the truth beyond verbal explanation. 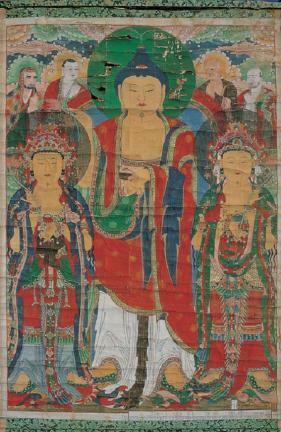 As an early Buddhist painting on the theme of the Vulture Peak Assembly, this work is also of great significance for the study of Buddhist iconography; it is a pioneering work introducing the novel iconography of Sakyamuni holding a lotus stem, and had served as the model for the Hanging Painting of Yongmunsa Temple, Yecheon (1709, Treasure No. 1445). Meanwhile, the magnificent combination of colors and sophisticated brushwork make this work a flattering example of early 18th-century Joseon Buddhist paintings.